In 2014 Julia Alvarez received the National Medal of the Arts Award from President Barack Obama. An icon in Latino literature, Dominican-American poet, novelist, essayist and writer in residence at Middlebury College, Julia has supported and inspired the girls, volunteers, and staff at The Mariposa DR Foundation since the beginning. Her novel, “In the Time of the Butterflies” tells the story of the Mirabal sisters, the heroines of the Dominican Republic, who lost their lives fighting for social justice in the times of Trujillo. Tesha McCord Poe is a passionate educator and fundraiser who uses her legal and business background to support the long term success of nonprofits. A graduate of Barnard College, Columbia University with a B.A. in economics, Tesha received a JD/MBA from Northwestern University and has worked in several industries including broadcast journalism, banking, corporate law, and as a tenure track law teacher. Tesha spent the last decade working as a senior administrator in independent schools in the Bay Area where she helped set and implement innovative educational strategies and provide growing revenue streams. In Fall 2018, Tesha joined the Boys and Girls Club of the Peninsula as the Chief Development Officer which serves 2,500 students in 9 sites near Palo Alto. Prior to BGCP Tesha led advancement teams at Castilleja School and Hillbrook School. 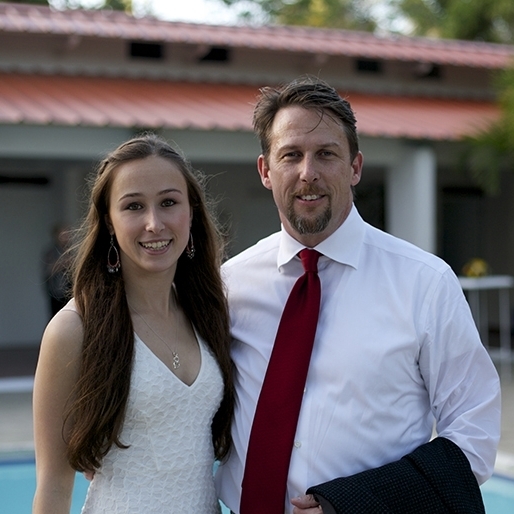 Jay Dunn with his daughter and fellow Mariposa supporter, Tori. Raymond (Jay) Dunn is the Executive Director of the Dunn Family Charitable Foundation, a private foundation based in Massachusetts and focused on poverty alleviation and social justice. Professionally, Jay has over 30 years of experience in international finance, primarily in private equity and venture capital investments. He is a Founding Managing Director for GGE Investments LLC, a clean tech investment and development company. Jay also serves and has served on other non-profit Boards in Latin America and Africa. Jay received an M.A. in Latin American Studies and International Economics from the Johns Hopkins University School of Advanced International Studies (SAIS) and a B.A. in International Politics and Economics from Middlebury College. Stacey Kertsman is Dean of Equity Education and Social Impact and Director of the Center for Awareness, Compassion, and Engagement (ACE) at Castilleja School, an all girls school in Palo Alto, CA. In 1992 Patricia Thorndike Suriel arrived in Cabarete, Dominican Republic and founded Iguana Mama Mountain Bike and Adventure tours, an eco-tourism company that helped put the Dominican Republic on the map as an international adventure destination. Offering her clients discounts up to 25% if they donated children’s books in Spanish, Suriel was able to build three small libraries at local schools. The building of these libraries lead to the founding of her first “not for profit” in 1999 “The Friends of the DR.” In 2002, with Suriel at the helm, this same organization moved into working full time and became the Dominican Republic Mentoring And Education Project (DREAM) Project. In the 2009 Suriel began to develop the concept that would become the Mariposa DR Foundation and in October 2009 the Mariposa DR foundation was granted their 501(c3) status. Patricia married Freddy Mendez Suriel in January 1995. The couple has two children Tatianna and Nicolas. The family founded Cabarete Coffee Company and Tours, which they donated to the Foundation in 2017. Jessica and her niece Olivia, a previous long-term volunteer. Jessica Mitchell earned a BS in Education from SUNY Cortland (New York) in 1994 as well as Montessori Certifications at the Early Childhood and Elementary levels. She was a teacher at the Elizabeth Ann Clune Montessori School for 5 years, and then homeschooled her own children Max, Emma and Ivy for 3 years. Jessica has a passion for cooking and nutrition, stemming from extensive travel through South America, Europe, and Asia. After homeschooling, she decided to focus on this passion, and became a caterer and event planner, working privately and for the Ithaca Beer Company’s farm-to-table restaurant.